The iPad edition of the October issue is ready for download and the print version is making its way to subscribers as I type this! I must say, I love the cover! 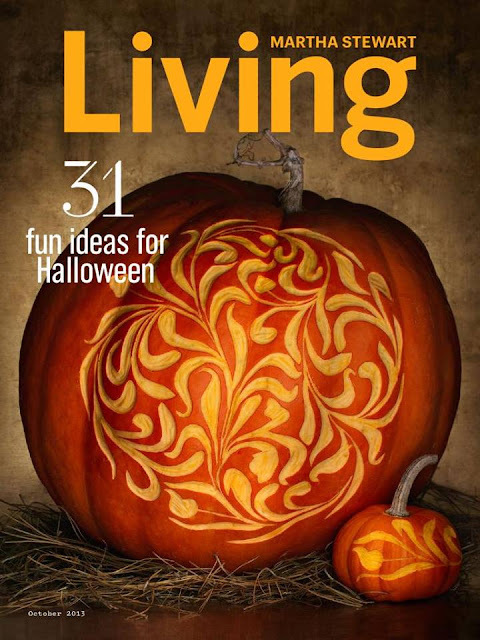 We get a double hit of Halloween this year with Martha's all-new special Halloween issue (now on stands) and this glorious October issue with 31 more fun ideas for Halloween. Watch for this issue on newsstands soon. October is my favorite! I love the simplicity of the covers lately. Very clean. Thought the new Martha Stewart logo would be used for this issue but not yet. I do notice that her name color now matches the Living color. Very good observation! I hadn't noticed that. I think we'll see some changes to the masthead in the New Year: Martha's name in larger font, etc. Martha seems interested in Maine and parts north and essay bu J Courtney Sullivan interested me. Think that you do give great re-enforcements of comments here. LIVING is changing as is our beloved Martha.